"I make useful things that look useless and useless things that look useful: things that move and things that look as if they are moving: things that are there and things that look like they should be somewhere else. In the past I made machines that manifested “artificial stupidity”, a book combining the heuristics of overcoming a creative block with a fictional language of real objects and hypnotized spectators in an empty gallery, publishing the transcripts of what they “saw”. For Angus-Hughes Gallery I revisit the familiar - including the repeated, the reversed and the mesmeric – as well testing the going on some new ground. The Palindrone Dansette is a portable device that plays vinyl records backwards and forwards at haphazard intervals and was originally made as a test rig for The Reversing Machine. Another, as-yet-unnamed, piece references a long history of patent devices for mechanising altered states of consciousness – purporting to induce a trance-like state in the complicit user. Also included is a selection from a body of drawings made under self-hypnosis over the past seven years and shown for the first time; these may reveal something about what is going on in the rest of the work (or just what was going on in my mind the day they were made). Finally, new sculptural objects that link form and language in oblique but telling ways. 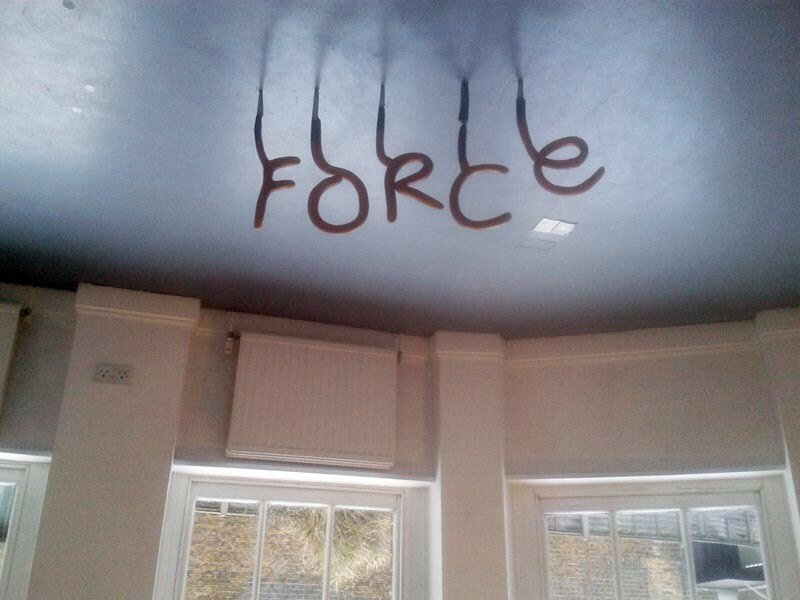 A New Word Order and ShankForce – show another strand of the my practice in which text becomes a part of objects which remind us of the complications that can arise between what we write, what we mean and what we do."